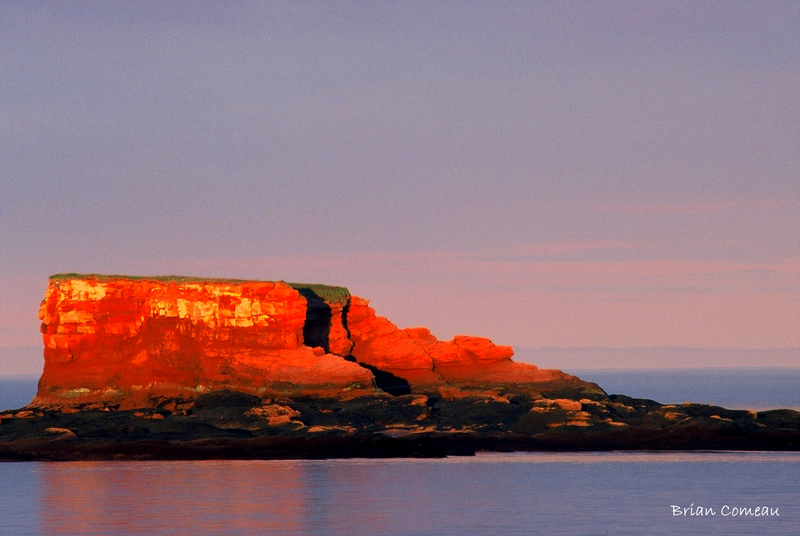 Living next to the Bay of Fundy provides an abundance of photographic opportunities. Some places are more renowned than others. I love to drive the Fundy Coastal Route in New Brunswick and investigate the area between St. Andrew’s and Fundy National Park. Along the way there are many famous destinations such as the Hopewell Rocks or the Caves of St. Martins but for me the real excitement happens when I discover the lesser known. 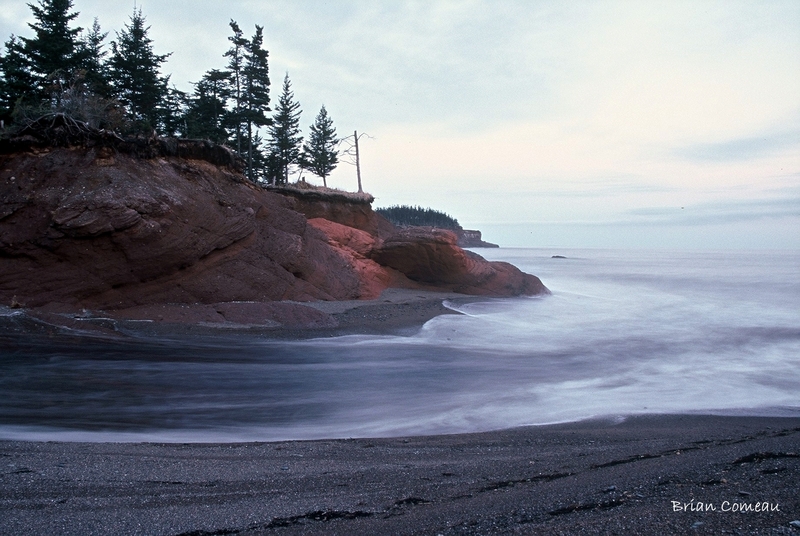 High Tide – The rush from the Bay of Fundy along a sandstone cliff. If you happen to be on your way to St. Martins to investigate the caves, do yourself a favor and take the scenic route via 825 instead of the usual route 111. I decided to one day about 15 years ago and it lead me to a place that has become a favorite getaway for me and my family. The area is Gardner’s Creek and specifically Duck Pond Road. Gardner’s Creek doesn’t share the fame of places such as Cape Enrage or The Fundy Trail but it should. That being said I’m OK that it doesn’t because I really don’t want to share, to be honest. Sorry I’m selfish, but for good reason; I can’t think of a more beautiful and pristine place. The centrepiece of Gardner’s Creek is Split Rock. Split Rock is a red sandstone island that is separated from the mainland at high tide, but accessible at low tide. This is when you want to go. Care must be taken if you do investigate at low tide because tide changes can happen quickly and water levels can increase by 20-30 feet. (My wife likes to remind me eight hours is a long time to spend on a big rock.) You also need to take extreme caution when walking on the rocks at low tide because they do get very slippery and you can hurt yourself. I know this from experience. While hiking around Split Rock I’ve seen everything from crabs, sandpipers and seals to a peregrine falcon. Don’t worry if there is no wildlife present, there is still a lot to see. 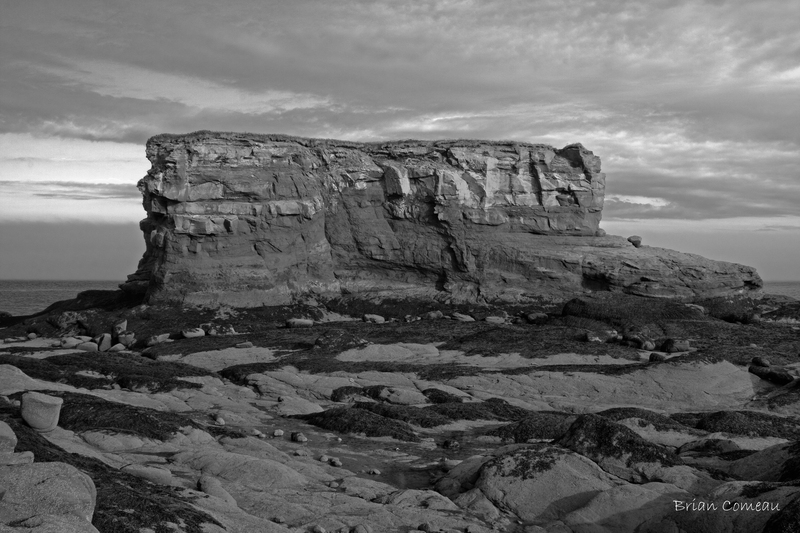 From small caves that have been carved by the waves of the Bay of Fundy, to sandstone pillars, and of course Split Rock Island itself. Opposite to the beach there is “Duck Pond” and a small brook that carves its way through the beach and sandstone which also provide additional photo opportunities. Taking photographs along the Bay provides unlimited possibilities but it’s not without its challenges. 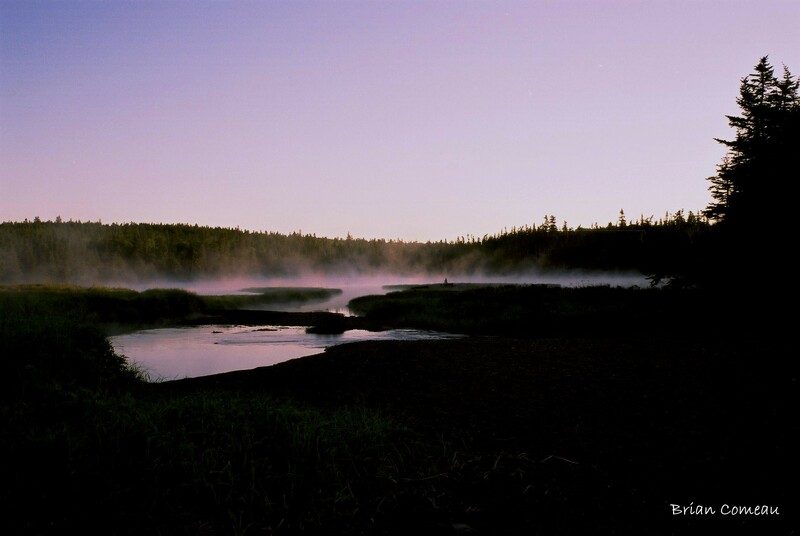 The fog can be very heavy in the summer so at times your intended subject is not even visible. With that said, sometimes the fog will enhance the mood of a scene adding drama to an image. Make sure to protect your equipment, fog and salt water spray can cause havoc on camera electronics. The Bay of Fundy is a treasured area for me and provides so many places to photograph, again some famous and others not, like Gardner’s Creek. I’ve lived 60 minutes from there my whole life and only discovered it by chance. Sometimes getting off the beaten path provides a welcome surprise. I encourage you to do it sometime. When you visit just remember the words of John Kay; “Take nothing but pictures and kill nothing but time”. This applies anywhere for that matter.